This article is about Charles Kanaʻina, noble of the Kingdom of Hawaii. For Kanaʻina, the aliʻi chief who greeted and grabbed Captain Cook before his death, see Kalaimanokahoʻowaha. Charles Kanaʻina, officially referred to as His Honour and His Highness, (Kanaʻina II) (c. May 4, 1798 – March 13, 1877) was an aliʻi (hereditary noble) of the Kingdom of Hawaii and father of William Charles Lunalilo, the 6th monarch of the Kamehameha Dynasty. Kanaʻina was a descendant of several figures from ancient Hawaiian history, including Liloa, Hakau and Umi-a-Liloa of Hawaiʻi Island as well as Piilani of Maui. He served on both the Privy Counsel and in the House of Nobles. He was named after his uncle Kanaʻina, a name that means "The conquering" in the Hawaiian Language. This uncle greeted Captain James Cook in 1778 and confronted the navigator before he was killed. His wife Miriam Auhea Kekāuluohi was a widow and niece of Kamehameha I. She was also married to Kamehameha II before he converted to Christianity and gave up all but one wife. Kanaʻina and Kekāuluohi lived in a traditional aliʻi style home in a sacred neighborhood in Honolulu called Pohukaina near Kekūanāoʻa, Kaʻahumanu and their offspring. The compound would eventually become the Iolani Palace (the official Royal Residence of the Hawaiian Royal Family) and Palace Walk when Kekūanāoʻa built Hale Aliʻi in the center of the families estates as a gift to his daughter Victoria Kamāmalu. Kanaʻina kept his property at the palace until his death and would be the only original owner to do so while the Palace was in use, living there through five monarchs, from the 1820s to 1877. Kanaʻina's son, William Charles Lunalilo, was named by Kamehameha III as an heir to the throne of the kingdom and ascended in 1873 while his father still lived. Lunalilo died only a year later, three years before his father's death on March 13, 1877. Having not re-written his will, which left everything to his son who had predeceased, Kanaʻina died intestate. Probate hearings proceeded for 5 years. On final adjudication his property was auctioned with the proceeds going to several of Kanaʻina's cousins including Ruth Keelikōlani and Bernice Pauahi Bishop. Charles Kanaʻina Eia was born about May 4, 1798[note 1] at Napoʻopoʻo, Hawaiʻi, although the exact year has been dated as late as 1812. [note 2]There was speculation Kanaina was not a High Chief by birth, however recent research has identified his father to be Eia Kalaiku'ahulu, the famous prophet kahuna that predicted the coming of Christianity to Hawaii. He was the son of Prince Kumukoa( Son of King Keawe and Queen Kanealai) and Kaulahoa. (Fornander Collection of Hawaiian Folk-lore,pg 322)Through his mother Kauwā, Charles Kanaʻina is descended from aliʻi nui (supreme ruler), Keakealanikane and his wife, Kaleiheana[note 3] making him a descendent of the first aliʻi nui Liloa through both sons, Umi-a-Liloa and Hakau. In the 2000 publication; "Kamehameha's Children Today", authors Charles Ahlo, Rubellite Kawena Kinney Johnson and Jerry Walker state that Kanaʻina's maternal grandfather, Palila Nohomualani was Kamehameha I's grandson through the monarch's first born child named Kahiliopua, a daughter of Kalola-a-Kumukoa. This genealogy is based on previously unpublished family trees compiled by the DeFries family. Eia and Kauwā's other four children were named Naʻea, Iʻahuʻula, Kahele and Kaikumoku. Eia and Kauwa were also the grandparents of Queen Kalama, Queen Emma, as well as King Lunalilo. He was named Kanaʻina, after the nickname of his uncle Kalaimanokahoowaha, the Native Hawaiian drawn by artist John Webber, who greeted Captain James Cook and was present at the navigator's death at Kealakekua Bay. In the Hawaiian language, ka naʻina means "the conquering". Kanaʻina was part of the kaukau aliʻi class, which was one of five levels of kānaka maoli (ʻōiwi) (Native Hawaiian) aliʻi (hereditary noble) status that served the ruling class as close relatives. Kanaʻina married Miriam Auhea Kekāuluohi in 1821. Kekāuluohi had been one of several wives of both Kamehameha I and Kamehameha II. In 1819 Kamehameha I died. His son would take Kekāuluohi as one of his own queen consorts however, under the influence of Christian missionaries, Kamehameha II renounced all his other wives except one. Kekāuluohi was then free to marry Kanaʻina after they both took Christian first names. The couple was married on Kauaʻi. They both write with great readiness; and the husband with a freedom and command of hand that would class him among good penman anywhere. Both are among the most studious and improving of their compeers. Next to their home was an old estate that had been demolished called Hanailoia. This was the spot of an ancient heiau called Kaahaimauli. In July 1844 Kekūanāoʻa began building a large home here as a gift to his daughter Victoria Kamāmalu. Instead, Kamehameha III would buy the estate and use as his Royal Residence after moving the capitol of the kingdom to Honolulu. It would become the Iolani Palace. As older aliʻi died, the lands were passed down and concentrated into fewer hands. Kekāuluohi's lands were passed down to her from the Kamehameha family. When she died, she left her accumulated lands and wealth to her son, not her husband Kanaʻina however, Lunalilo predeceased his father. Kanaʻina served as a member of the House of Nobles of Kamehameha III from 1841 to 1876, on the Privy Council from July 29, 1845, to 1855, and on the Supreme Court from when it was first founded on May 10, 1842. In the tradition of European royalty, he was granted the style (manner of address) of "His Highness". Kanaʻina and Kekāuluohi had two sons. Their first son Davida, died young. Their surviving natural son, William Charles Lunalilo was born on January 31, 1835, at Pohukaina. He was considered the grandnephew of Kamehameha I, and second cousin to King Kamehameha V, King Kamehameha IV, and Princess Victoria Kamāmalu, through his mother, Kekāuluohi, who was the cousin of Elizabeth Kīnaʻu (later called Kaʻahumanu II). Lunalilo was declared eligible to succeed by the royal decree of King Kamehameha III and sent to the Chief's Children's School (later called the Royal School) when it was founded by missionaries Amos Starr Cooke and Juliette Montague Cooke. They had several hānai (informal adoption) children, Kalama, the daughter of Iʻahuʻula (Kanaʻina's sister) and Naihekukui. Kalama was also the wife of Kamehameha III. Kanaʻina and Kekāuluohi would hānai Kalama and Kamehameha III's second son Keaweaweulaokalani II.He also hanai his youngest brother, Kaikumoku's daughter, Hattie Kaumuali'i'kalani Kana'ina. She was his namesake. Kanaʻina acted as trustee of the royal lands that had been inherited by his wife while his son was a minor, and after his son's death. When Kanaʻina died, the court appointed nine trustees, six of which would take part in the militia that overthrew the monarchy and also take part in the new provisional government. Dole himself had been on the record as supporting the break up of crown lands to promote American style farming in his newspaper in 1872. Various lawsuits ensued over the property including a suit questioning the validity of the will due to Lunalilo being under the guardianship of his father when he made it out. Lunalilo had requested in his will to use the estate to fund a charity. The trustees favored splitting up the estate by selling it off, while others claimed the value of land was underestimated, and an endowment to run the charity could have been funded by lease income. For example, Kanaʻina leased (and later his heirs would sell) thousands of acres of land on the island of Hawaii to businessman (and son of missionaries) William Herbert Shipman. Kanaʻina died on March 13, 1877, in Honolulu, Oahu, and was buried at Kawaiahaʻo Church in the Lunalilo Mausoleum, next to his son who had died before him. While Kanaʻina had made out a will, he had left everything to his son, and so had died intestate. Petitions to administer the estate began the following day. Probate proceedings were litigated for four years, between 1877 and 1881, and re-affirmed in 1886. Attorney General Alfred S. Hartwell applied for the appointment of trustees shortly after Kanaʻina's death under the articles of Lunalilo's will. Article three of that will bequeathed the entirety of his estate to three trustees appointed by the Justices of the Supreme Court of the Hawaiian Kingdom. The property was to be sold and invested until the sum of $25,000.00 was raised to fund a home for the poor and destitute. Chief Justice Charles Coffin Harris ordered a hearing for April 5, 1877, to hear the petition pertaining to the estate of the late Charles Kanaʻina and anyone who could show reason not to grant it. A petition was filed by King David Kalakaua and his sisters and brother-in-law, Lydia K. Dominis, Miriam K. Cleghorn and Archibald Scott Cleghorn, with a hearing set by Justice Lawrence McCully. In July 1878, Justices Harris, Judd and McCully heard Kalakaua's appeal. While the Justices felt that the claim of Kalakaua and his sisters had not been proven, they were impressed with that of Kilinahe (Kanaʻina's first cousin) and other claimants based on testimony and witnesses. The court decreed that the estate be split into four equal shares: one quarter to go to Haalilio (k), Haalelea (k) and Kahukaiola (k); one quarter each to Pahua (w) and Kaahua (k); and one quarter to the widow and children of Kilinahe, who had died before the adjudication of his claim. Claimants from the line of Moana Wahine made petitions to the court under the act of 1874 to quite land titles. The act was later deemed unconstitutional and a new decree of heirship was made. By December 1879 disbursement of land in trust with William Cooper Parke, (Marshal of Hawaii from 1853 to 1884) and owned by heirs, could not be agreed upon for settlement. Most supported the sale of the lands, so an order was made and all land sold at auction. Final adjudication of probate found a total of eight parties or groups of relatives, most of whom were descended from Moana and her four husbands, as heirs to the Kanaʻina estate splitting a total of 9 shares, with 2 shares going to one party. The probate records include a great deal of information from the four years of litigation. A great number of people petitioned the courts to claim title as heirs after the initial 1878 judgement. In the final adjudication, Bernice Pauahi Bishop received two of the nine shares. The remaining seven of the nine shares were divided equally in 1/9th and distributed to Ruth Keelikōlani, Haalilio and Haalelea (namesakes of the historic figures), Kilinahe (Whose grandmother was the older sister of Kanaʻina's mother and 5 other parties. The first three trustees included John Mott-Smith and Sanford B. Dole. Today, there are claims of heirs having closer relations then those awarded the shares. Namely the living descendants of Kana'ina's youngest brother, Kaikumoku. Kaikumoku had two daughters with Kamakahai: Lahapa and Hattie Kaumuali'i'kalani Kana'ina. "Kana'ina" later married William Rose and had several living issues. The Hawaii public archives building, built in 1906 on the ʻIolani Palace grounds, in a section that was formerly the Kanaʻina's estate, was dedicated as the Kanaʻina building. It held state offices in the 1950s, added as a contributing property of the Hawaii Capital Historic District and then restored for the Friends of ʻIolani Palace in 1990. January 8, 1873 Father to His Majesty, William Charles Lunalilo. Upon the ascension of his wife to the position of Kuhina Nui on April 5, 1839, Charles Kanaʻina took on the formal style of His Highness. 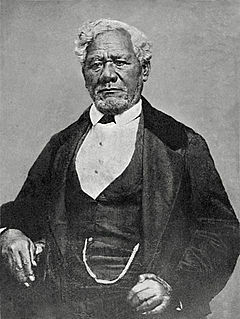 On May 10, 1842 to January 15, 1848 Charles Kanaʻina was named Justice of The Hawaiian Superior Court giving him the style of The Honourable Charles Kanaʻina. ^ Church records indicate a birth month and day: (Mormon Church Genealogical Library, Honolulu): CHAS. KANAINA EIA born 4 May 1798; (married Kekauluohi about 1822[sic]). ^ Many sources have different dates. Author Barrère has compiled all other known birth dates as follows; Charles Kanaina was born ca. 1802 in Napoopoo, Kona. Born ca. 1801: Friend, April 1877, says he died at age of 76 Born 1802 or 1804: "I am about 58 years old, it may be 60" (Kanaina's testimony 7 Feb. 1862 in Equity 200) Born ca. 1802: KiA Paulo Kanoa's testimony in Probate 1562 (Kalama, 1870): "I was 10 years old when 1 first knew Kanaina [Kanoa was born ca. 1802-4]. He was born in Napoopoo, Hawaii; it was the time when Kamehameha went to Hawaii" [1812, when Kanoa was ca. 10]. Kapahu, w. and Kahele, w. were his kahu "in the latter years of his life." "Kapahu and Auwae, long time servants to Chas. Kanaina " Auwae named a son Kanaina, but he is "not related to him." (Mis. Pam. Vol. II, BishopMusDU 620M 67). ^ The genealogy of Henry Howard Kauauanuiamahi De Fries, given on August 22, 1901 and printed by The Honolulu Advertiser. Noted from above: Charles Kana'ina had a 1/2 sister named Kapau, and a full sister named Kahele. This would make sense that these woman were his kahu in his later years. Wikimedia Commons has media related to Charles Kanaina. ^ a b c Forbes 2001, p. 641. ^ Amalu 1955, p. 18. ^ a b Barrère 1994, p. 240. ^ Young 2012, p. 37. ^ a b McKinzie 1986, p. 73. ^ a b Mitchell 1903, p. 350. ^ Society of Utah 1933, p. 24. ^ Ahlo, Johnson & Walker 2000, pp. 64–76. ^ Young 2012, p. 38. ^ Taylor 2015, p. 66. ^ Fornander & Stokes 1880, p. 193. ^ Dibble 1843, p. 38. ^ Young 2012, p. 55. ^ Young 2012, p. 34. ^ Amalu 1955, p. 133. ^ Moore 2015, p. 112. ^ a b c Thrum 1904, pp. 75–76. ^ Stewart 1831, p. 137. ^ Stewart 1831, pp. 137–138. ^ Judd 1975, p. 66. ^ Roth 2006, p. 26. ^ Van Dyke 2007, p. 325. ^ Thurston 1904, p. 5. ^ Amalu 1955, p. 118. ^ Gould 1874, p. 24. ^ Luomala 1987, p. 26. ^ Van Dyke 2007, pp. 324–331. ^ Cahill 1996, p. 152. ^ Sheldon 1897, p. 423. ^ Harris 1877, p. 2. ^ McCully 1877, p. 2. ^ Foster 1893, p. 627. ^ Foster 1893, pp. 633–638. ^ Young 2012, p. 153. ^ Foster 1893, p. 626". ^ Hatchie 1978, pp. 295–296. ^ Gould 1877, p. 30. ^ Knight 2014, p. 435. ^ "Naita Kea Nui o Kamehameha I | nupepa". Ahlo, Charles; Johnson, Rubellite Kawena Kinney; Walker, Jerry (2000). Kamehameha's Children Today. Native books inc. ISBN 978-0-9967803-0-8. OCLC 48872973. Barrère, Dorothy Benton (1994). The king's mahele: the awardees and their lands. D.B. Barrère. ASIN B0006PCCKU. OCLC 31886789. Cahill, Emmett (1996). The Shipmans of East Hawaii. University of Hawaii Press. ISBN 978-0-8248-1680-3. OCLC 33440153. Davenport, William H. (1994). Piʻo: an enquiry into the marriage of brothers and sisters and other close relatives in old Hawaiʻi. University Press of America. ISBN 978-0-8191-9395-7. OCLC 29549096. Dibble, Sheldon (1843). History of the Sandwich Islands. Press of the Mission Seminary. ISBN 978-1-275-85242-6. OCLC 616786480. Forbes, David W. (2001). Hawaiian National Bibliography. 3. University of Hawaii Press. ISBN 978-0-8248-2503-4. OCLC 78982237. Fornander, Abraham; Stokes, John F.G. (1880). An Account of the Polynesian Race: Its Origins and Migrations, and the Ancient History of the Hawaiian people up to the time of Kamehameha I. II. Trubner And Co., Ludgate Hill. ASIN B008FSJAGY. ISBN 978-1-330-05721-6. OCLC 4888555. Foster, William (1893). Reports of Decisions Rendered by the Supreme Court of the Hawaiian Islands. 8. Hawaiian Gazette Company Print. ASIN B009L9K7DG. OCLC 27083322. Gould, M.T.C. (1874). "The Friend, Or, Advocate of Truth". 22 (3). M.T.C. Gould. ISBN 978-1-276-43616-8. Gould, M.T.C. (1877). "The Friend, Or, Advocate of Truth". 26 (3). M.T.C. Gould: 30. Hatchie, Joseph Kalani Puahi Kilinahe (1978). Inclusion of native Hawaiians in certain Indian acts and programs : hearings before the United States Senate, Select Committee on Indian Affairs, Ninety-fifth Congress, second session, on S. 857 ... S. 859 ... S. 860, February 13-15, 1978. United States Government Printing Office. ASIN B003TV3JWS. OCLC 4053822. Judd, Walter F. (1975). Palaces and Forts of the Hawaiian Kingdom: From Thatch to American Florentine. Pacific Books, Publishers. ISBN 978-0-87015-216-0. OCLC 2073825. Knight, Gladys L. (2014). Pop Culture Places: An Encyclopedia of Places in American Popular Culture [3 volumes]: An Encyclopedia of Places in American Popular Culture. Greenwood. ISBN 0-313-39882-8. OCLC 870981427. Kuykendall, Ralph Simpson (1953). Hawaiian Kingdom 1854–1874, twenty critical years. 2. University of Hawaii Press. ISBN 978-0-87022-432-4. Luomala, Katharine (1987). "Reality and Fantasy: The Foster Child in Hawaiian Myths and Customs". Pacific Studies. 10 (2). Archived from the original on March 4, 2016. Retrieved December 31, 2015. McKinzie, Edith Kawelohea (1986). Hawaiian Genealogies: Extracted from Hawaiian Language Newspapers. University of Hawaii Press. ISBN 978-0-939154-37-1. Moore, Susanna (2015). Paradise of the Pacific: Approaching Hawaii. Farrar, Straus and Giroux. ISBN 978-0-374-29877-7. Mitchell, John Hipple, United States. Congress. Senate. Committee on Pacific Islands and Porto Rico (1903). Hawaiian Investigation: Report of Subcommittee on Pacific Islands and Porto Rico on General Conditions in Hawaii. Government Printing Office. Roth, Randall W. (2006). Broken Trust: Greed, Mismanagement, And Political Manipulation at America's Largest Charitable Trust. University of Hawaii Press. p. 26. ISBN 978-0-8248-3044-1. Sheldon, H.L. (1897). "Reports of Decisions Rendered by the Supreme Court of the Hawaiian Islands". 10. Hawaiian Gazette Company Print. ISBN 978-1-248-54404-4. OCLC 27083322. Stewart, Charles Samuel (1831). A Visit to the South Seas, in the U.S. Ship Vincennes: during the years 1829 and 1830; with scenes in Brazil, Peru, Manila, the Cape of Good Hope, and St. Helena. J.P. Haven. ISBN 978-1-110-08024-3. OCLC 2781278. Society of Utah, Genealogical (1933). "The Utah Genealogical and Historical Magazine". 24. Genealogical Society of Utah. Taylor, Albert Pierce (2015). Under Hawaiian Skies. BiblioBazaar. ISBN 978-1-113-48870-1. OCLC 479709. Thrum, Thos G. (1904). All about Hawaii: The Recognized Book of Authentic Information on Hawaii. Honolulu Star-Bulletin. OCLC 1663720. Thurston, Lorrin Andrews (1904). The Fundamental Law of Hawaii. The Hawaiian Gazette. ISBN 978-1-130-69936-4. OCLC 475581605. Van Dyke, Jon M. (2007). Who Owns the Crown Lands of Hawai'i?. University of Hawaii Press. ISBN 978-0-8248-3211-7. OCLC 257449971. Young, Kanalu G. Terry (2012). Rethinking the Native Hawaiian Past. Routledge. ISBN 978-0-8153-3120-9. OCLC 39505599. The ʻIolani Palace was the royal residence of the rulers of the Kingdom of Hawaii beginning with Kamehameha III under the Kamehameha Dynasty (1845) and ending with Queen Liliʻuokalani (1893) under the Kalākaua Dynasty, founded by her brother, King David Kalākaua. It is located in the capitol district of downtown Honolulu in the U.S. state of Hawaiʻi. It is now a National Historic Landmark listed on the National Register of Historic Places. After the monarchy was overthrown in 1893, the building was used as the capitol building for the Provisional Government, Republic, Territory, and State of Hawaiʻi until 1969. The palace was restored and opened to the public as a museum in 1978. The ʻIolani Palace is the only royal palace on US soil. Lunalilo, born William Charles Lunalilo, was the sixth monarch of the Kingdom of Hawaii from January 8, 1873 until February 3, 1874. Due to his popularity and status as Hawaii's first elected monarch, he became known as "The People's King". Mauna ʻAla in the Hawaiian language, is the Royal Mausoleum of Hawaii and the final resting place of Hawaii's two prominent royal families: the Kamehameha Dynasty and the Kalākaua Dynasty. Miriam Likelike Kekāuluohi Keahelapalapa Kapili was a Princess of the Kingdom of Hawaiʻi, sister of the last two ruling monarchs, mother of Princess Kaʻiulani, last heir to the throne, and mistress of the ʻĀinahau estate. She shared the same name with Likelike, an earlier Hawaiian chiefess. Kalama Hakaleleponi Kapakuhaili was a Queen consort of the Kingdom of Hawaiʻi alongside her husband, Kauikeaouli, who reigned as King Kamehameha III. Her second name is Hazelelponi in Hawaiian. Victoria Kamāmalu Kaʻahumanu IV was Kuhina Nui of Hawaii and its crown princess. Named Wikolia Kamehamalu Keawenui Kaʻahumanu-a-Kekūanaōʻa and also named Kalehelani Kiheahealani, she was mainly referred to as Victoria Kamāmalu or Kaʻahumanu IV, when addressing her as the Kuhina Nui. Miriam Auhea Kalani Kui Kawakiu o Kekāuluohi Kealiʻiuhiwaihanau o Kalani Makahonua Ahilapalapa Kai Wikapu o Kaleilei a Kalakua also known as Kaʻahumanu III, was Kuhina Nui of the Kingdom of Hawaii, a queen consort of both King Kamehameha I and Kamehameha II, and mother of another king. In Hawaiian, her name Kekāuluohi means the vine growing with shoots. She adopted her secondary name Auhea, meaning Where, oh where, in memory of the death of Kamehameha I.
Mataio Kekūanaōʻa (1791–1868) was descended from the high chiefs of the island of Oʻahu. His first name is the Hawaiian form of Matthew. Kekūanaōʻa translates as "the standing projection" in the Hawaiian language. Kaʻiminaʻauao was a Hawaiian high chiefess who was given in adoption to Queen Kalama and King Kamehameha III. She died of the measles at the age of three, during an epidemic of measles, whooping cough and influenza that killed more than 10,000 Native Hawaiians. Her elder brother and sister became King Kalākaua, and Queen Liliʻuokalani. Keahikuni Kekauʻōnohi was a Hawaiian high chiefess who was a member of the House of Kamehameha. She was granddaughter to King Kamehameha I and one of the wives of Kamehameha II. Her Christian name is disputed; it is given as Mikahela in the 1848 Mahele Book and as Miriam in later sources. David Kamehameha (1828–1835) was a member of the royal family of the Kingdom of Hawaii. Miriam Auhea Kekāuluohi Crowningburg Kamai was a high chiefess during the Kingdom of Hawaii. She was a cousin of King Lunalilo and namesake of his mother Kekāuluohi, however was rarely referred to as Kekāuluohi II. In the Matter of the Estate of Charles Kanaina was the litigation over the estate of Charles Kanaina that occurred between 1877 and 1881 brought by claimants under Kanaina's maternal grandmother, Moana and her four husbands, for quiet land titles ending with the adjudication of several heirs. 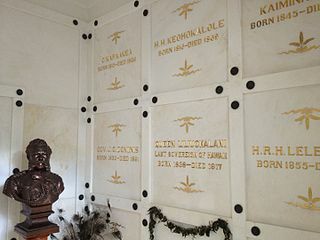 The Lunalilo Mausoleum is the final resting place of Hawaii's sixth monarch King Lunalilo and his father Charles Kanaʻina on the ground of the Kawaiahaʻo Church.